Saturday April 16- 1932. I was busy part of the forenoon. I had a letter from Paul McCallister of Texas and wrote him as well as Ida in PM. I read in the evening and wrote Mrs Ben Price in Pasadena. It rained in PM. 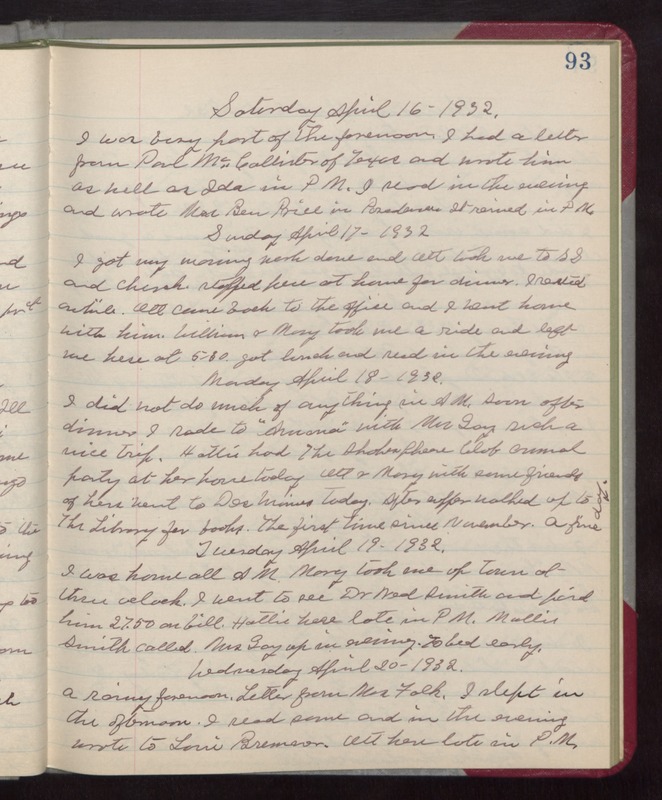 Sunday April 17- 1932 I got my morning work done and Ott took me to SS and church. Stopped here at home for dinner. I rested awhile. Ott came back to the office and I went home with him. William & Mary took me a ride and left me here at 5-30. got lunch and read in the evening Monday April 18- 1932. I did not do much of anything in AM. Soon after dinner I rode to "Amana" with Mrs Gay. Such a nice trip. Hattie had the Shakespheare Club annual party at her house today Ott & Mary with some friends of hers went to Des Moines today. After supper walked up to The Library for books. The first time since November. A fine day. Tuesday April 19- 1932. I was home all AM. Mary took me up town at three oclock. I went to see Dr Ned Smith and paid him 27.50 on bill. Hattie here late in PM. Mollie Smith called. Mrs Gay up in evening. To bed early. Wednesday April 20- 1932. A rainy forenoon. Letter from Mrs Falk. I slept in the afternoon. I read some and in the evening wrote to Louie Bremner. Ott here late in P.M.